Darren Jolly had 17 hitouts and 10 possessions in his return from a knee injury against Williamstown on Sunday. Photo: Shane Barrie. At three quarter time, it seemed like Victoria Park was playing host to the match of the day. Collingwood’s VFL team had hassled and pressured the third-placed Williamstown and looked set to run over the top of their more fancied opponents. The Pies trailed by only two points after kicking the last four goals of the third quarter, reeling their opponents back in after the Seagulls kicked away to a 25-point lead midway through the term. Unfortunately the predictions of a Magpie-runaway went awry. Instead it was Williamstown that had all the fun. Peter German’s side kicked the first six goals of the final quarter to run out 35-point winners. Recap collingwoodfc.com.au’s live coverage of Sunday’s loss to Williamstown. Western Bulldog forward Patrick Veszpremi enjoyed the ample supply he received from further afield, kicking three of his four goals in quick succession to snuff out any hopes of a Collingwood comeback. But once the dust had settled, things weren’t so gloomy. For starters, Alan Didak played arguably his best match of the season so far. It wasn’t merely the fact that he gathered 26 possessions (15 kicks, 11 handballs) and took the ball inside 50 five times. What is so heartening is the impact he had with his possessions and his ability to do the little things, such as a quick-fire handball in heavy traffic or a clever kick into space, which stamped him as one of the best players on the ground. 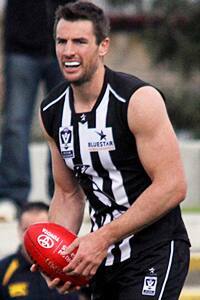 Didak headlined several big name Magpies who were looking to press their claims for a return to the senior side. Paul Seedsman returned from a calf injury and was a steadying influence across half back with 26 possessions (14 kicks, 12 handballs) and seven marks. He also took the ball out of the defensive 50m four times and assisted with his side’s kick ins. Further up the ground, Andrew Krakouer found 19 possessions (12 kicks, seven handballs) and four clearances. His work in close was again a highlight as was the mark he took in the second quarter. Caught behind an opponent on the wing, Krakouer, without using his hands, leapt up high enough to reach over the top and poach the ball out of his opponent’s hands. Collingwood took three ruckmen into the match. Veterans Darren Jolly (knee) and Ben Hudson (calf) made successful returns from injury, supporting young tyro Jarrod Witts who spent most of his day playing as a key forward. Jolly shared his time between the ruck and full forward. He managed a team-high 17 hitouts to go with his 10 possessions (five kicks, five handballs). Conditions didn’t favour him overhead but his ability to create a contest and bring the ball to ground ensured that Collingwood were potent in attack. Hudson, meanwhile, won 15 hitouts and nine possessions but provided protection for some of the younger onballers and clearly relished the minor skirmish that broke out at half time. Another noteworthy performer was Tim Broomhead (26 possessions, 18 kicks, eight handballs, seven marks, four clearances) who showcased his ability to have an impact with his clean hands in close before running to space where he can be a dangerous option heading into attack. Jack Frost made a solid return from a PCL injury against his former side. His fierce tackling and second efforts were prime examples of his hunger, one tackle in particular noticeably lifting the side in the third quarter. Key forward Jackson Paine also made his presence felt. He kicked three goals on a day that wasn’t suited to key forwards and threatened to catch fire when playing within 40m of goal in the third quarter. Collingwood remains in the top eight by virtue of losses sustained by the Northern Blues and North Ballarat on Sunday afternoon. Both teams are only four points behind the Magpies and had a healthier percentage heading into round 16. Essendon is also within touching distance. Its win over Sandringham has seen it move to seven wins, just one behind the seventh-placed Collingwood. The Pies will travel to North Ballarat’s Eureka Stadium next Sunday to take on the Roosters in a must-win game for both clubs. The match will begin at 2pm.